Another Linssen Magazine already? 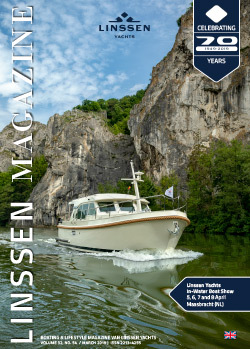 Yes, your eyes are not deceiving you, just six weeks after our autumn edition we are delighted to present you with the ‘Special Edition dot sero series’ of the Linssen Magazine. We are extremely proud of our new model series. We have listened carefully to your input and we therefore want to share the product with you during its development and construction, rather than waiting for the actual introduction in 2017. We let you see the drawings of our designer Anne Elsinga, the digital conversion to our CATIA 3D programme and photos of the hull construction. From April 2017, you can admire the finished first products in the .0 series. Up until then, you will of course be more than welcome in Maasbracht! However, our sales staff are keen to keep you personally informed of progress. The first Grand Sturdys in the .0 series have already been sold and the first Grand Sturdy 500s have been reserved for eager owners. Expectations are running very high. We hope that you will enjoy reading this special edition and be encouraged to request more information about the latest developments.